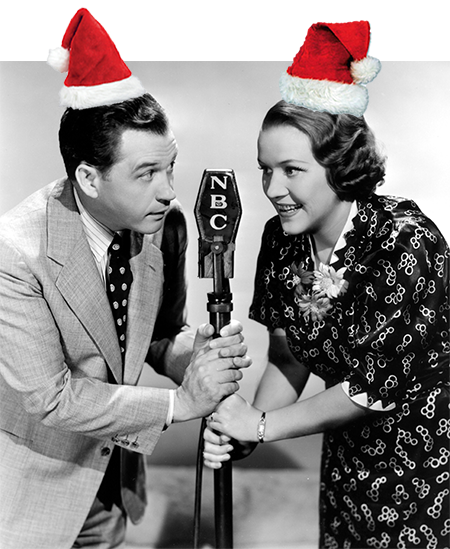 "Haggling over a Christmas Tree"
One of the most popular old time radio comedy shows of all time, Fibber McGee and Molly were on the air from 1935 until 1959. Jim and Marian Jordan star as Fibber McGee and Molly. Join the resident at 79 Wistful Vista for this jolly collection of Fibber McGee and Molly Christmas shows. A mysterious Christmas package arrives from Uncle Sycamore causing curious Fibber to have the package x-rayed. The McGee's snooty neighbor, Gildersleeve, sends Fibber a mean phonograph for the holidays. Fibber McGee and Molly visit "Christmas Tree Marvin"
And Fibber opens his closet to sneak a peek at his Christmas presents…big mistake! The Fibber McGee and Molly Christmas collection includes 40 holiday episodes of this well loved comedy old time radio show. See also: Great Gildersleeve Christmas Collection, Jack Benny Christmas, and Comedy Christmas. MERRY CHRISTMAS JON! I can't tell you how happy I am that I discovered your wonderful website this past year. I love looking all the old photos, radios, ads and memorabilia. Those really were the good old days weren't they? You know loving old time radio is a lot like that Harley Davidson saying: "if I have to explain it to you -- you probably wouldn't understand." Thanks for sending all of the mp3 cds that I ordered. My trusty Sony mp3 player continues to play them flawlessly. I love listening to those great old classic shows every night before I go to sleep. Those who continue to order shows on regular cds are truly missing out on the savings. I know. I did it for years. Anyway as you probably know I do prefer drama over comedies and always will. However I'm warming up to the funny stuff and plan to order both the Fibber along with the Gildersleeve Christmas shows tomorrow. So if we don't chat before the 25th... let me wish you and your cat a very Merry Christmas and a happy and healthy new year. And as always thanks for all the joy and fun you have provided me this past year. And above all keep doing what you're doing. We appreciate you. Take care.